wander / wonder: 'Happy' Independence Day? To us, Independence Day is a day of fun, and excitement as most of us watch the parade our town/city hosts; watch fireworks and have barbecues. A day to mingle with family and friends; to remember good times and old days. But have you ever wondered what happened to the fifty-six men who signed the Declaration of Independence? 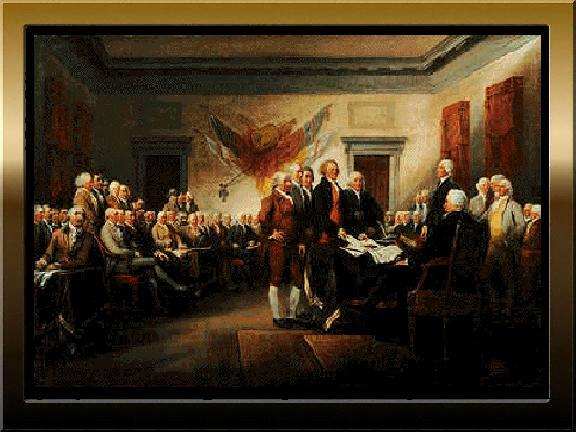 The men that founded our country, and made it as free as it stands today? Five signers were captured by the British as traitors and tortured before they died. Twelve had their homes ransacked and burned. Two lost their sons in the Revolutionary War, another had two sons captured. Nine of the fifty-six fought and died from wounds or the hardships of the Revolutionary War. Carter Braxton of Virginia, a wealthy planter and trader, saw his ships swept from the seas by the British navy. He sold his home and his properties to pay his debts, and died in rags. Thomas McKean was so hounded by the British that he was forced to move his family almost constantly. He served in Congress without pay, and his family was kept in hiding. His possessions were taken from him and poverty was his reward. At the battle of Yorktown, Thomas Nelson, Jr. noted that the British General Cornwallis had taken over the Nelson home for his Headquarters. The owner quietly urged General George Washington to open fire. The home was destroyed, and Nelson died bankrupt. John Hart of New Jersey was driven from his wife's bedside as she was dying. Their 13 children fled for their lives. His fields and gristmill were laid to waste. For more than a year he lived in forests and caves, returning home to find his wife dead and his children vanished. A few weeks later he died from exhaustion and a broken heart. Lewis Morris and Philip Livingston suffered similar fates. "For the support of this declaration, with the firm reliance on the protection of the Divine Providence, we mutually pledge to each other our lives, our fortunes, and our sacred honor." So whenever we wish a friend or loved one, or complete stranger Happy Independence Day, try to remember those who gave their lives; their homes; and their Liberty, that we might gain ours. Thank you for sharing this. As much history as I've studied, I've never learned it like April has. It's fascinating to see what was really behind the declaration. I cannot help being reminded of our Lord Jesus Christ and the sacrifices He made for our salvation. He is so dear to me. It is so true. They gave everything for a free life, and He gave everything for eternal life with Him! Our world history is so interesting! I am always learning! You be blessed as well, dear friend! This day is unknown for me. But thanks to your explanation, I believe it is a very important day for your country. Is it one day or two days? Thanks for visisting my blog. Dutch is a difficult language for foreigners. But Englisch is for me a complicated.difficult language. Often I use 'google translator' to translate some words. And the burgers for sure! Is that America got its Independence today! Was free from all others! What our forefathers have done! I only know one language, (English) and some Spanish. Dutch is not very common in the USA. :) I used the Google translator to translate your blog! Mikailah; Reading your post brought back memories of seven years ago....I used to sit and read, and read, and read....all about the Revolution, the British empire, Napoleon; history is such a living study. I enjoyed reading your post...thanks! Much love, your sister in Christ! What a great post I loved it! Keep up the awesome work.